I am a Toronto-based writer who has had an unwavering passion for the written word since I was a child. In fact, I started my own make-shift publishing company at the ripe old age of seven, crafting a series of children’s books that were bound with staples, wool and tape! But somewhere along the way my aspirations were placed in the "long shot" category as I pursued a "sure thing" in the corporate world; something many of us do to avoid the uncertainty attached to becoming a proverbial starving artist. Security and family responsibilities pushed that little girl who had so much faith in her God-given gift into the depths of my repressed creative core. In 2015 circumstances in my life aligned in a manner that motivated me to take the pen that little girl had been extending to me all these years and start writing again! I realized two very important things: 1) God gave me the gift of writing for a purpose; 2) If God is perfect, I needed to trust that whatever proceeds from him is also perfect including the gift he gave me and believe I could be a successful writer! Philippians 4:13 says, "I can do all things through Christ who strengthens me." With this knowledge, I brushed the dust bunnies off my keyboard, cracked my knuckles, summoned my faith, put my nose to the grindstone and began to create! Food for thought: When you are operating within your purpose, it doesn't even feel like work. Nine months and 120,000+ words later, I completed my very first novel, SOARING ABOVE THE FLAMES. Approximately a year and half later, I completed my second book, WALKING THROUGH THE FLAMES; hence, The Flames Series of books was conceived and born into the literary world! 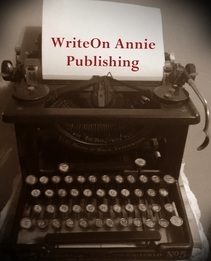 Being an indie author, I established my own publishing company, WRITEON ANNIE PUBLISHING where the books are bound with materials that have a bit more longevity than staples, wool and tape! Nevertheless, the red tape on that make-shift publishing company I started more than three decades ago has finally been cut. Consider this your special invitation to follow me as I embark on this adventure into the literary world. I hope it will inspire you to free fall into your own dreams using Godly faith as your fail-proof safety net. To God be the glory!